Pancakes… oh how I love pancakes. There was a time, after realizing how severe my intolerance was to certain foods, when I thought I would never get to enjoy pancakes again. I tried all kinds of “paleo” pancakes and would always end up feeling bloated, heavy, and uncomfortable from loads of almond flour and a tummy full of super dense wanna be pancakes that didn’t even fit the bill. Now that I have been at it in the kitchen for a couple years, I have started to figure out how to recreate certain foods without the bloat or discomfort and WITH all the flavor and textures that I remember and love. These pancakes are nut free, oh so fluffy, and just hearty enough to be a vessel for whatever topping your heart desires. Plus, they bring the flavors of the season with fresh cranberries, a hint of tart lemon, a bit of sweet honey, and the goodness of whole fat yogurt. To give someone the joy of being able to eat pancakes with the ones they love after never feeling like they could have that joy again is worth every criticism. I know the feeling of watching family and friends enjoy the foods I used to love from the sideline, feeling a bit outcast and sometimes, a little bummed. Now, though, I can make these foods for my family and friends and enjoy the fruits of my labor with a happy heart and a really happy tummy. Is this the most nutrient dense breakfast you could eat today? Not necessarily, but if one person comes to my blog after seeing a picture or link to this recipe and tries them, only to realize that they do in fact like “clean” food, that’s a win. After enjoying some whole food pancakes (with some added nutrient dense bonuses like gelatin and coconut), that same person might stumble upon a recipe for clean meatloaf, and then grass fed chuck roast over cauli-rice, and then they might just give bacon liver paté a try. Do you see where I am going with this? There is a lot of dogma out there when it comes to this real food movement, but what really matters is that people are moving in the right direction and making life-saving changes, even if it is in baby steps. From processed flours and table sugar to healthier, real food flours with natural sweeteners, like raw honey, that haven’t been altered in any way. Now those same folks are eating things that could truly change their lives for the better, OR they’re removing things from their diet that were slowly ruining their health and leading to an early death. 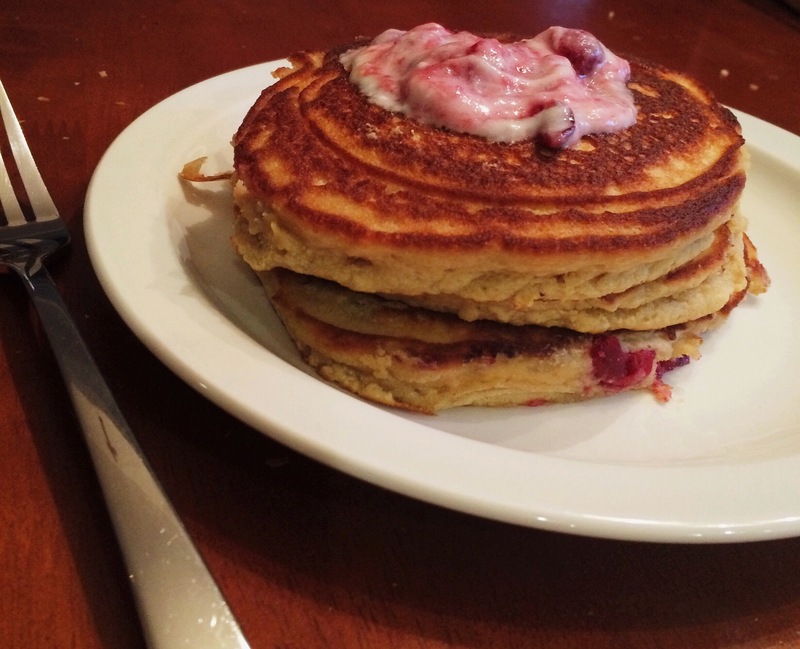 Are “paleo” pancakes saving the world? That might be a stretch, but these are damn good, and I hope that anyone who tries them enjoys them as much as we did! So don’t eat these every day, but certainly whip up a batch at least once this holiday season, while cranberries are ripe, spirits are high, and joy is all around us. Happy holidays, guys! Cheers to an awesome finish to 2014! Please leave your thoughts in the comments, and as always, share this recipe with friends and family! Baby steps towards better health for the long haul!